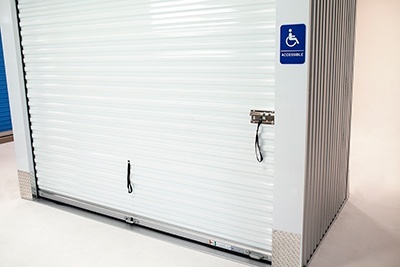 In 2010, the American with Disabilities Act of 1990 updated their standards to include scoping requirements for self storage facilities. As a result, there are now specific guidelines to ensuring your facility is ADA compliant. According to the ADA, standard scoping requirements for a facility that has 200 or less units requires 5% of the units to be ADA compliant. For example, a facility with 180 total units will have 9 accessible units. If your accessible unit count doesn’t come out to a whole number, it would be in your best interest to round up. Facilities that have more than 200 total units require 10 accessible units, plus 2% of the excess. A facility with 350 total units will have 13 accessible units. Let's say you have a mix of 5x10, 10x10, and 10x15 storage units at your facility, with some climate controlled and some not. You could potentially have accessible 5x10 & 10x10 climate controlled, and 10x15 non-climate controlled unit mixes. This ensures that someone isn’t forced to rent a unit that is too large or too small for their needs because that is the only size that is compliant. According to Scott Zucker of Weissmann Zucker Euster Morochnik & Garber P.C., "...there appears to be no requirement to hold the unit back from rental solely for a disabled customer if other spaces are otherwise rented and the space is needed." Therefore, if the only available 5x10 climate controlled unit is accessible, you are able to rent it out to a non-disabled person. For swing doors, a pull can be installed on the door no lower than 15” and no higher than 48”. The pull includes a loop large enough to fit a fist. In addition to the pull, a plaque with Braille can be clearly displayed on the outside of the unit. Standard roll-up doors require the pull and plaque, but a nylon rope can also be installed on the bottom bar which hangs 15” - 48” when the door is open. This rope features a loop large enough to fit a fist. 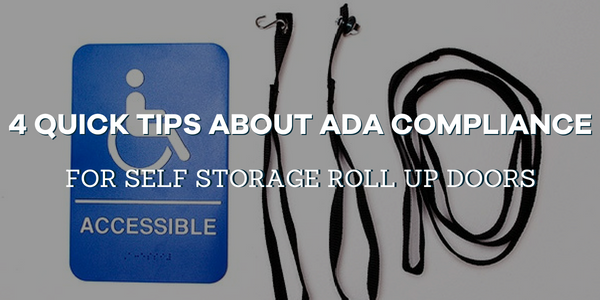 ADA requires that your door must be tensioned at 5 pounds. Luckily, Janus International steel doors are the only doors that inherently meet this requirement, so nothing extra needs to be done on your part! Exterior units require a ramp made of galvanized steel to cover the entire width of the unit. Bonus: we’ve made it nearly effortless for you to retrofit your doors with ADA compliant indoor, outdoor, and swing door kits that include all of the necessary modifications listed above. Visit www.storagedisabilityproducts.com for more information! If you have a parking lot at your storage facility, then you might want to consider having accessible parking spaces. The exact number of spaces depends on how many total parking spaces are offered. For every 25 total spots, up to 100, 1 accessible space is required. For example, a facility with 67 parking spots would require 3 accessible spaces, while one with 99 spots would require 4. For more in-depth information on the amount of accessible spaces recommended for your facility, visit the ADA website here. Bonus tip: if you plan to accept payments or rent units on your website, we recommend it is also ADA compliant. To do this, just add a screen reader to your site. This makes sure that someone with a disability is able to read and understand your website. This can easily be done through your web developer. As Randy Tipton said, "ADA is going to become a bigger issue for self storage facilities." While it may not seem like it could affect you and your business right now, you definitely do not want to be sitting on the receiving end of a lawsuit. 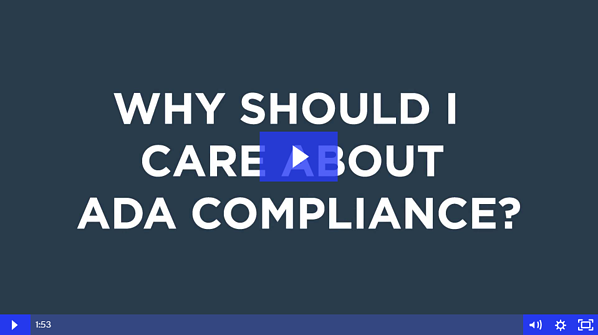 Want to hear more from Randy Tipton about the importance of ADA compliance? Check out our interview below! Have questions about making your facility the shining star on the block with ADA compliant roll up doors? We're here to help! Give us a call at 770-214-4284 today!